Day 81: Sick of Tissue? I was sick this week. Nothing too extreme, but a pretty bad head cold, sore throat, conjestion, headache. You know, the usual across-the-board malaise. Enough to garner me a couple sleepless nights and a day off (you know I’m sick when I take an unpaid day off work). But this leads me to the issue of tissue. We’re not supposed to be buying things except food and hygine basics. So I guess the question is the definition of “basics”. I think we had intended it to mean soap and maybe toothpaste, but that’s about it. Paper towels are out, toilet paper is in. . . tissue kind of falls in between. Originally I had envisioned using cloth hankies, but that seemed unrealistic once my nose became a faucet of snot. Sure, I don’t mind carrying around the occasional sneeze in my pocket, but at the rate I was going, I would’ve needed a bedsheet in my purse. Using toilet paper seems nearly the same as tissue except that it avoids the plastic film on the top of the box and is decidedly less soft and cosy. For now I’m in the clear because I still have a half-box of tissue on my desk at work. (Thank goodness I made a quick recovery.) I’m going to try to make it last all year, so i can avoid the dilemma of whether to buy a new box. In the meantime I’ve been composting my kleenex so at least it doesn’t end up in the bin. Oh honey, I think a box of tissues when ill definitely is allowed! 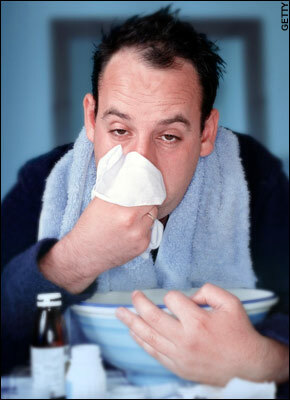 The worst bit for me with a cold is when the bit under your nose gets really sore and dry. Expensive, soft tissues can help with this and I wouldn’t hesitate to buy them – it’s only once every couple of years anyway. just going through the backlog of posts, since i just found this blog. went to the premier last night and it was great. Anyways about tissues, hankies do in fact work fine when you’re sick, however you need to use a neti pot 2 or 3 times a day. once you’re sinuses are clear it takes a few hours for them to fill up enough for your nose to drip again. That’s my experience anyways. Good tip. I’ve heard lots of great things about neti pots, even though the thought of having water running inside my nose isn’t that appealing. I guess it really would clear you out, and it stops the snot for a few hours, it would definitely be worth it! I’ve just come across your blog in my quest for reducing plastics. I just wanted to say that while hankies seem to sog rather quickly, there’s a big difference between men’s hankies and women’s. Women’s tend to be little scraps of nothing – half the size and half the absorbency of men’s. However, after having switched a few years back, I noticed that when I DO have a cold, I’m less facially abraded by hankies. Tissues are, after all, wood pulp. Also, if you’re chemically sensitive, the lotions and scents can make it worse, as can the “dust puffs” that come out every time you pull a tissue out of the box.